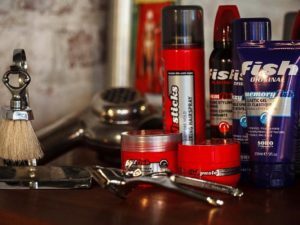 Style meets science with this innovative range of men’s haircare to promote thicker hair. 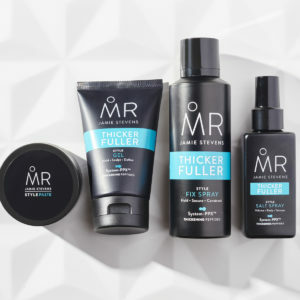 Born out of a need for results driven products that don’t sacrifice style, MR. is the ultimate men’s haircare system designed to help combat the challenges of thinning hair and provide everyday grooming staples to keep hair strong and healthy. MR. is the brain child of award-winning hair stylist Jamie Stevens. Jamie is three-time winner of Men’s British Hairdresser of the Year earning him a place in the British Hairdressing Awards Hall of Fame. He is the youngest ever nominee for Hairdresser of the Year, an award he has been nominated for four times and the creator of the MR. haircare system. 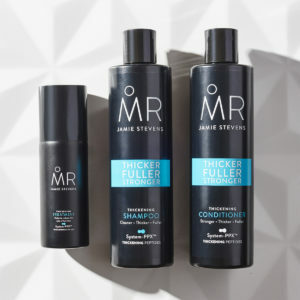 The MR. THICKENING category features grooming staples which are the foundation for any good haircare regime; Thickening Shampoo + Conditioner. It also contains a Treatment spray to help reduce the rate of hair loss by prolonging the hair growth phase. The MR. STYLE category features seven products to make achieving your everyday look easy, whilst the active thickening complex supports the strength and structure of your hair. The MR. DISGUISE category contains two hero products which provide an instant solution to the appearance of thinning hair, our Disguise Sprays add colour to the scalp and Hair Fibres build natural looking density. 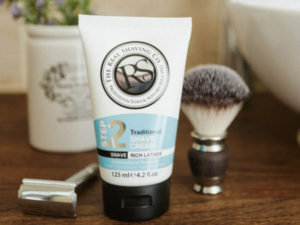 Want to learn more about MR. JAMIE STEVENS? Get in contact with a member of our sales team.